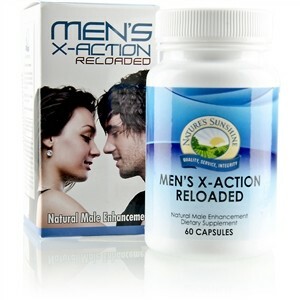 Men's X-Action Reloaded combines nutrients to support male reproductive function, sexual performance and enjoyment, prostate health and cardiovascular health. Ingredients in the formula work together to support optimal nitric oxide levels in the body. Nitric oxide relaxes blood vessels to enable optimal blood flow. Efficient blood flow is crucial for healthy male sexual activity and overall vascular health. Icariin, a flavonoid extracted from epimedium, may selectively inhibit phosphodiesterase type V (PDE-5), an enzyme that causes the male sexual response to subside. By blocking this enzyme, sustained activity may be promoted. Icariin also plays a role in increased smooth muscle relaxation and increased blood flow through its actions on cyclic guanosine monophosphate (cGMP) levels and nitric oxide synthase (NOs) activity. 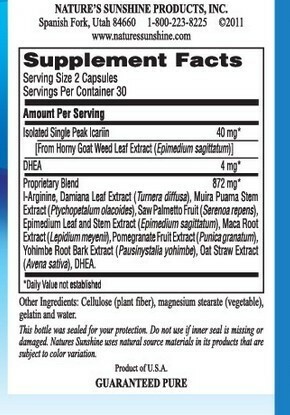 L-arginine, damiana leaf, muira puama stem extract, oat straw extract, saw palmetto fruit, epimedium leaf extract standardized to icariin content, maca root extract, pomegranate fruit extract, yohimbe root bark extract and DHEA. Take 2 capsules before bedtime daily for general libido support. Take 2-6 capsules one hour prior to sexual activity. CAUTION: Consult a doctor if you have a known medical condition, in particular those affecting blood pressure, hormone sensitivity, heart, liver or kidney. Consult a doctor if you are taking any medication, in particular those affecting blood pressure, heart conditions, diabetes, depression or erectile dysfunction. Discontinue use if troubling symptoms occur. Do not exceed recommended dosage. Not for use by persons under the age of 18 and/or pregnant or lactating women. Keep out of the reach of children.